EU - Following the introduction of new Country of Origin Labelling (COOL) regulations in the EU in April 2015, there was a concern that the trade in live pigs between EU countries could be reduced. Indeed, it would seem that it has had an effect on the live trade between countries such as the Netherlands, Denmark and Germany. There are virtually no live imports into the EU from third countries and only limited live exports to countries outside the EU, mostly to neighbouring countries such as Serbia, Albania and Moldova. The formerly important trade with Russia has now stopped, while trade with Ukraine is much reduced. The Dutch and Danes exported fewer pigs to Germany in 2015 versus a year earlier and Germany recorded a 7 per cent reduction in the volume of live imports over the same period. Denmark sends over half of its live pig exports, mostly weaners, to Germany. However, this trade decreased by just under 2 per cent in 2015, to 6.89 million head. Overall, the volume of live pigs it exported increased by 7 per cent, largely bolstered by increases in volumes to Poland and Italy on the year. The volume of live exports from the Netherlands has been decreasing over the past couple of years, and was down 38 per cent to 5.47 million head in 2015 versus 2014. This was largely driven by a decrease in German trade, which was down 48 per cent to 3.04 million head in 2015. This may be partly a result of the COOL rules, with processors less willing to pay for pigs which might require two different nationalities to be recorded on retail packs. 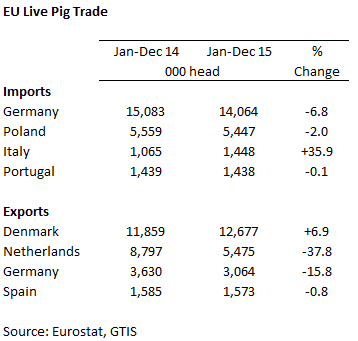 Germany is the largest importer of live pigs in Europe but it also exports both weaners and slaughter pigs and the latter trade was down sharply last year, again perhaps affected by COOL. As a result, Poland imported 2 per cent fewer live pigs in 2015, with the increase in imports of Danish weaners offset by a fall for German slaughter pigs.